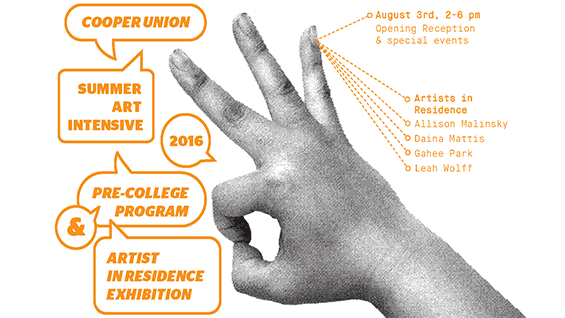 An exhibition of the digital photography, graphic design, animation and drawings of 85 high school students as well as works produced by artists in residence Allison Malinsky, Daina Mattis, Gahee Park and Leah Wolff of the Cooper Union Summer Art Intensive pre-college program. Exhibition open Monday - Thursday 10 a.m. - 5 p.m. Located on floors 2, 5 and 6 of the Foundation Building, 7 E. 7th St. Presentations by Artists in Residence in Rose Auditorium (41 Cooper Square) from 2 - 3 p.m.
Student animaton screening and poetry reading in Rose Auditorium 3 - 4 p.m. Opening reception begins at 4 p.m. The Cooper Union Summer Art Intensive is profoundly grateful to Jeffrey & Paula Gural for establishing the Jeffrey & Paula Gural Summer Art Intensive Scholarships. We gratefully acknowledge our other generous scholarship supporters: The Wishbone Foundation and The Dominican Commissioner of Culture.